Dr. Mary Karr teaches at the University of Syracuse and is the author of books of poems and biographies that have won wide acclaim in the United States. She converted to the Catholic faith about 12 years ago. I this audio interview, she gives an example of how conversion can happen, in her case through prayer. Fr. 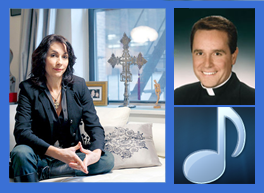 Dave Dwyer, CSP, of “Busted Halo Catholic Radio Program,” conducts this 30-minute interview with Mary Karr. Click on the player below to hear this podcast. Some of the imagery/language may seem blunt to some listeners, so please be forewarned.